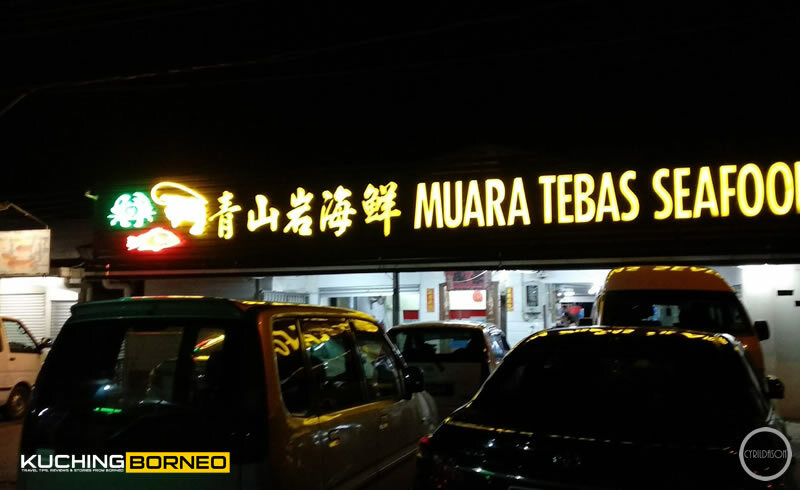 Muara Tebas Seafood is a very popular, but far away seafood restaurant in Kuching. 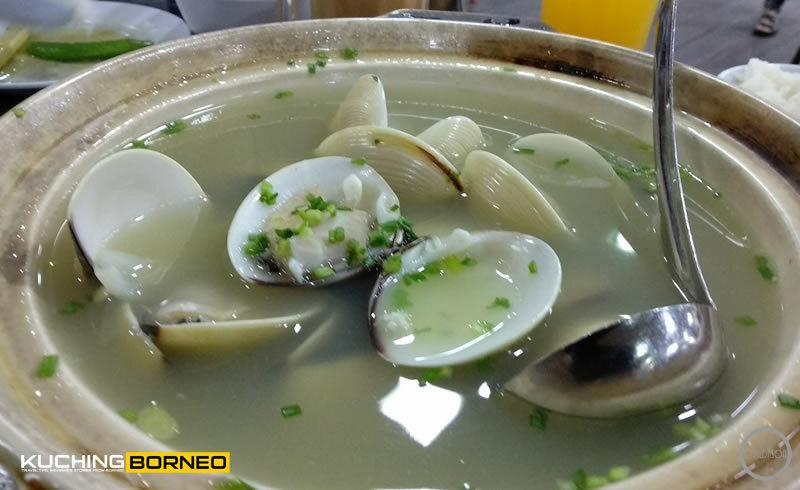 You see, when it comes to seafood, Kuching is indeed under-estimated as a seafood heaven because it’s quite far from the sea, and people prefer to mention its everyday street food like Laksa Sarawak or Kolo Mee when asked about what to eat when visiting Kuching. That’s not an issue really as I did a compilation of popular places to eat Laksa Sarawak in Kuching, but here I’m going to talk more about seafood. 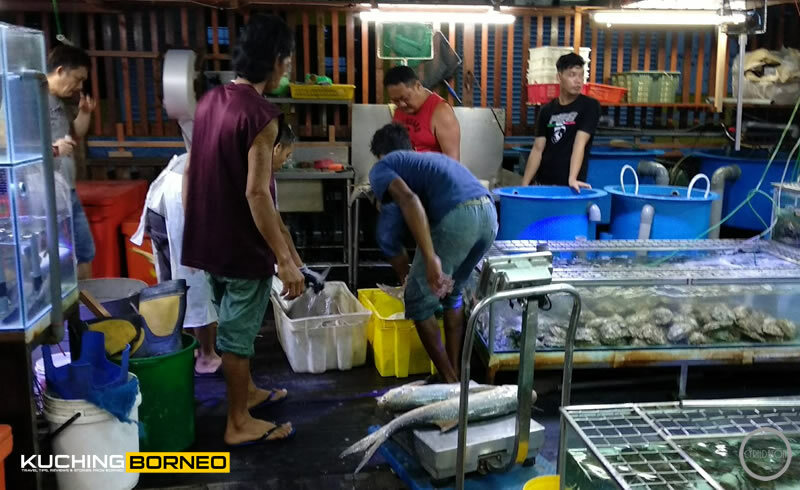 That said, many therefore do not realize or know that seafood in Kuching is indeed among the cheapest in Malaysia, with many West Malaysians in particular, saying it is very cheap if compared to theirs prices back home. Last weekend, I had time to go to yet another popular seafood restaurant, and it is located all the way in Muara Tebas. 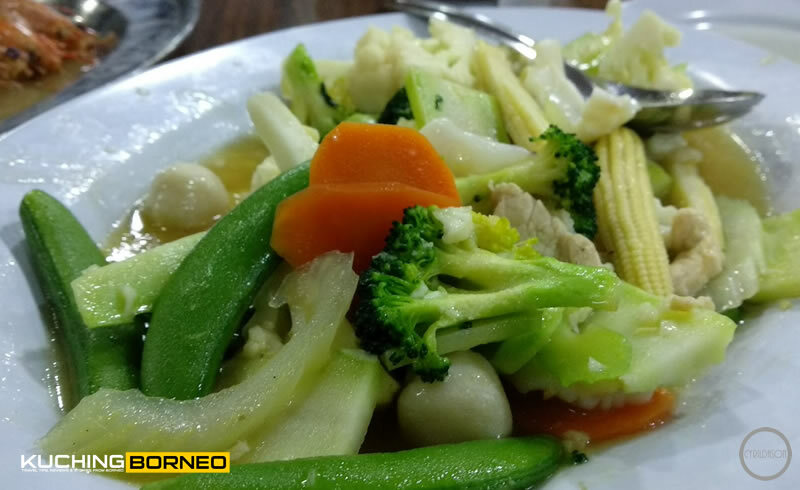 I say ‘all the way’ because the place, known as ‘Muara Tebas Seafood’ isn’t exactly nearby Kuching, located some a 30-45 minutes drive from the city, going through numerous villages and smaller towns before you finally reach the destination. Most people say that Muara Tebas Seafood is fairly priced and the food is yummy. I won’t argue with that statement after my visit as the price was fair in my opinion, and the food was generally nice, or according to my taste. 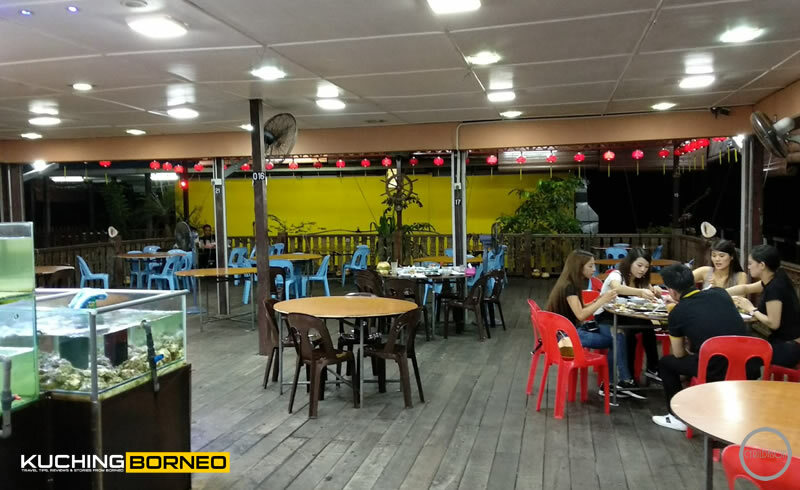 Upon arriving, the first thing you’d notice is that Muara Tebas Seafood is perched just beside the sea side, with part of the whole restaurant actually on water. 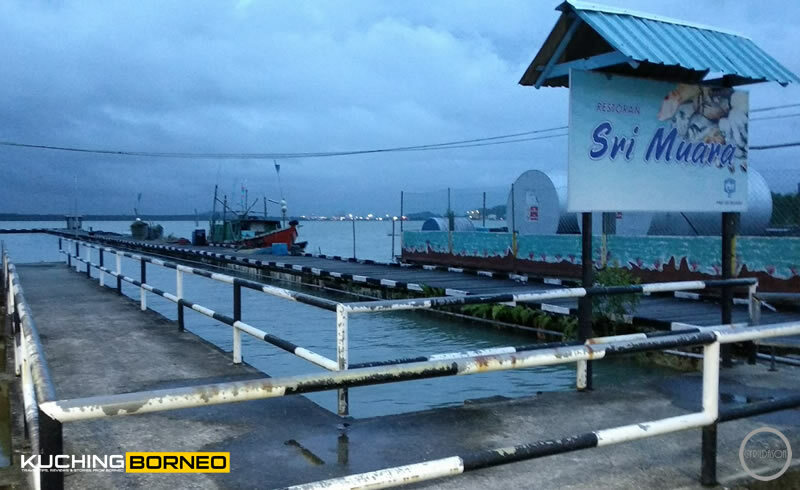 Since I came at dusk, there’s not really a view, but I could imaging this place having a perfect setting for a jetty like pre-wedding photo shoot, and also looking really nice and traditional during the day. There’s limited parking at the restaurant, and it seems some locals have taken the initiative to ‘help you find parking’ for a fee, which ranges from RM4-5 per car. I paid RM5 because I didn’t want to create a scene on a family day out, but I do hope authorities would look into this. Anyway, the front of the restaurant is clearly marked, and upon entering the restaurant, there’s a few set of aquariums places on each side, giving an immediate impression that the food here is fresh. In fact, when we arrived, a boat just docked, and fishermen were seeing unloading their catch for weighing at the restaurant. Seating is spacious at the restaurant, and it was really breezy, but I have no complaints. he dishes we ordered can be seen in the photos I’ve included below. Overall, the food was delicious, but special mention goes out to the White Clam soup which was perfect for a cold day, and the Oyster Omelette. I do not typically like Oyster Omelettes, but I’d give an exception for this one which I thought was brilliant. 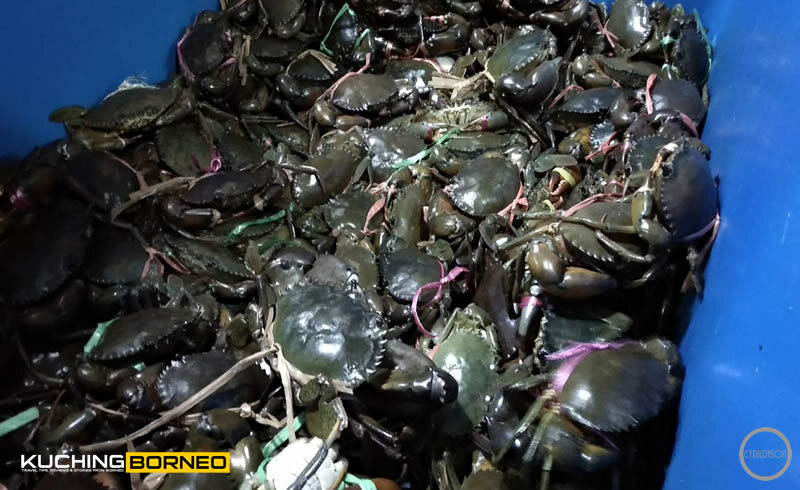 For crabs, orders are segregated by the size of the crab, with the most expensive ones charged at RM90 per kilo if I am not mistaken. 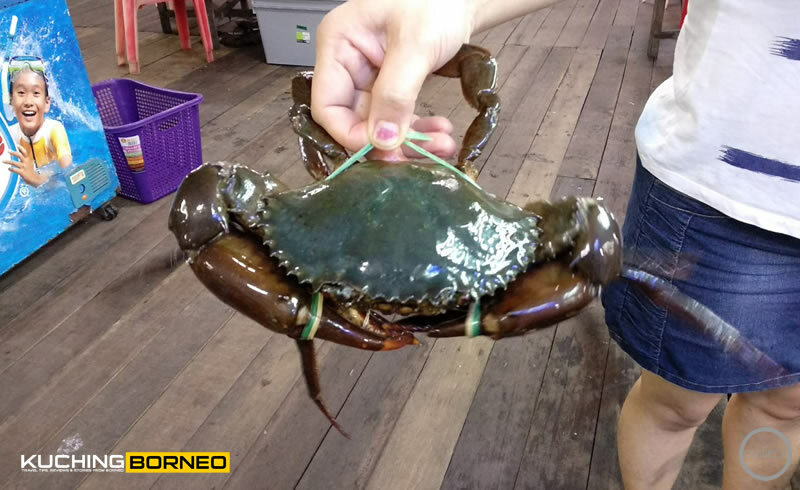 Mind you that I am in favour of mud crabs, so I really couldn’t be bothered to check out the prices of crabs known as ‘ketam suri’. The lady suggested I go for the medium sized crabs as it had more flesh and was more value for money. I however insisted I went for the biggest sized pool of crabs because small size crabs are more difficult to eat, and their shell can cause my lips to get cut, which isn’t something I favour. 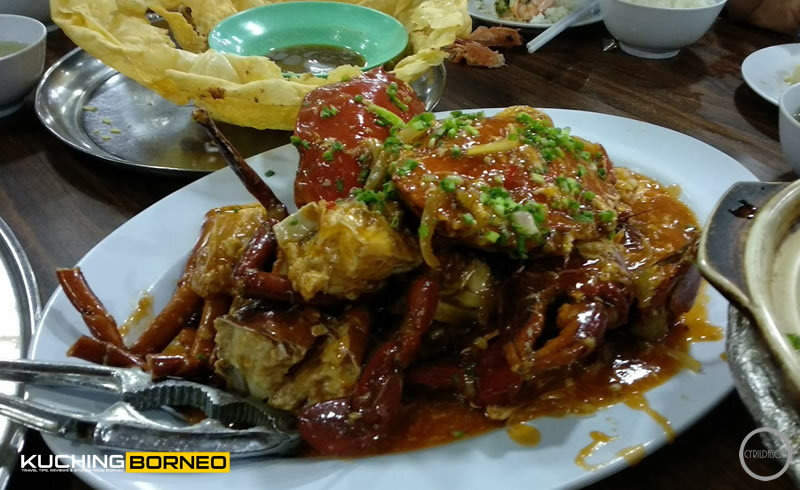 Despite the massive amount of crab options available, the restaurant doesn’t have much options in how they can cook them, limiting cooking style to crabs cooked in egg, sweet sour, black pepper and butter. As you can see below, we went for the sweet sour crabs which was really good. 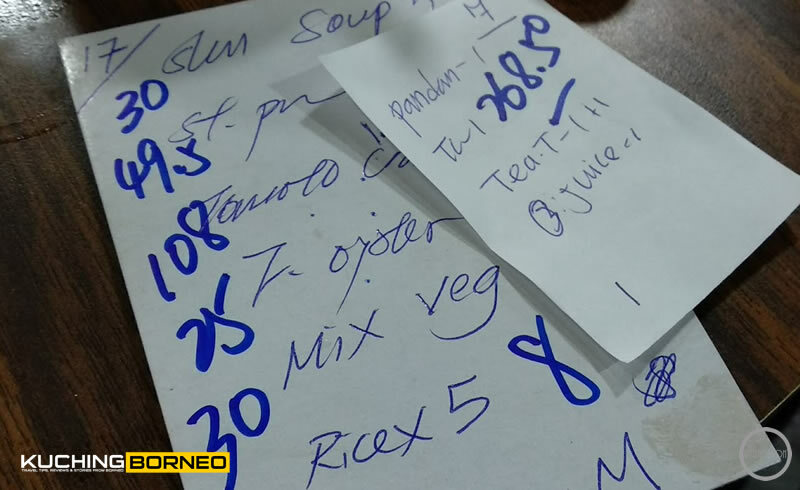 At the end of the day, the bill came, and we were charged RM268 inclusive of drinks, which I feel was a fair price considering we doubled on the drinks. 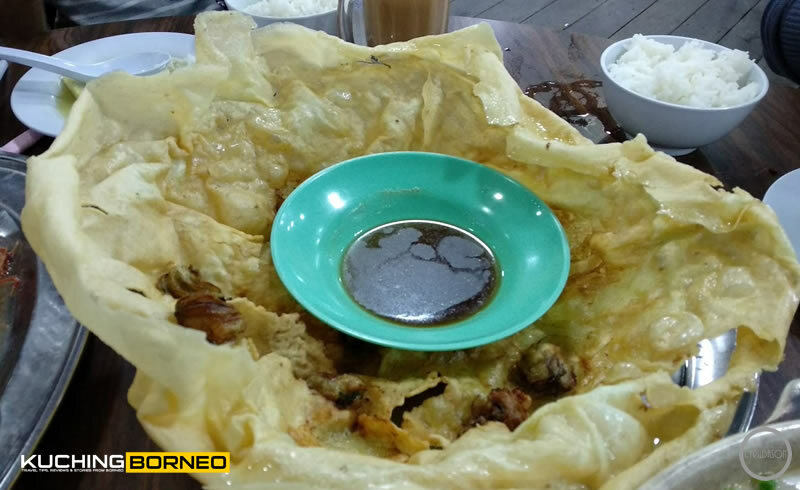 The food was for six pax, and it was classified as ‘medium’ for all servings, except for the crab, in which the size of the crab decided the price of the dish. If you are not familiar with the route to Muara Tebas, then the Google Map below would definitely help. 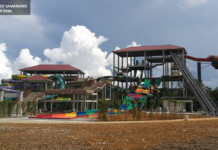 Mind you that the journey would bring you through the city, Senari port, and to a narrow two way road, but you will be greeted with a huge arch when you reach Muara Tebas. The road is lighted almost all the way to the restaurant. As I mentioned above, parking is limited, but be prepared to pay premium price for ‘parking help’. Last but not least, the Muara Tebas Seafood opens daily until 8PM. However, I would advice you to make a call before you go there because the last thing you want is have that long journey go to waste due to the restaurant taking a day off. Thehe Muara Tebas Seafood Restaurant can be reached at +6082-438219. If you think driving up to Muara Tebas Seafood is too far, then Kuching does have several other options nearby. 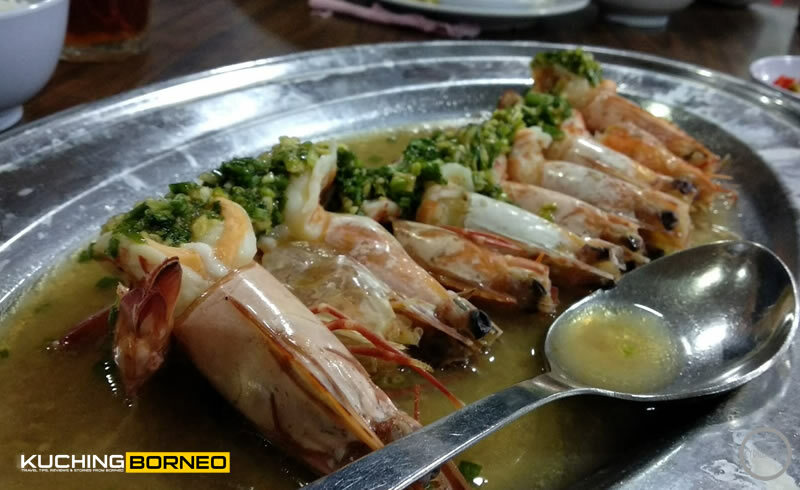 To know these options, check out our KuchingBorneo.info Popular Places to Eat Seafood in Kuching.